Yummy! A healthy lunch can help you feel energetic instead of sluggish around 3pm. I love combining sweet bell peppers with savory foods like Swiss chard and parmesan along with the added crunch of pine nuts. Swiss chard is a delicious green that is an excellent source of vitamin A, an important vitamin for both eye and heart health. Garbanzo beans are a good source of magnesium and an excellent source of folate. Magnesium is a nutrient that historically women lack. It’s important for blood glucose control, diabetes prevention, muscle and nerve function, and blood pressure regulation. Folate is another lacking nutrient in women, important for preventing birth defects, and prevention of heart disease and certain types of anemia. Pine nuts are a good source of iron. Around 5% of women between the ages of 20 and 49 have iron deficiency with anemia and 11% have iron deficiency without anemia. Iron deficiency is seen in around 20-25% of the world’s population, and it is predominately seen in women and children. Iron works in the body by helping bring oxygen to muscles, while supporting metabolism, making it crucial for the body. Try eating and or growing this nutrient powerhouse recipe today! Wash all vegetables and herbs and scrub lemon thoroughly. Rinse 1 can of garbanzo beans (rinsing decreases sodium by 40%). Cut Swiss chard leaves into 1 inch long pieces, keep majority of stems. Sauté Swiss chard over medium heat with olive oil (and/or vegetable broth to lower fat content) toss often –make sure you don’t overcook and it remains bright green. Add in yellow pepper and chopped herbs. Add in garbanzo beans, lemon juice and pine nuts. Cook for 1-2 more minutes. Top with shaved Parmesan and a dash of soy sauce. Makes 2 large servings Nutrition facts per serving: Calories: 443.5; Total Fat: 15 g;Saturated Fat: 2 g; Protein: 19.25 g; Carbohydrates: 57.25 g; Dietary Fiber: 14.25 g; *Sodium: 381 mg. *Sodium Calculated with soy sauce. 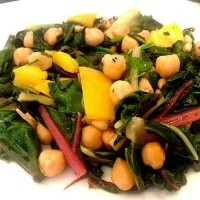 Try this easy swiss chard recipe and join me on Melissa’s Healthy Living facebook and pinterest for more yummy ideas! « New, Old, Odd and Fad Fitness Workouts– Could they work for you? I’m a sucker for garbanzo beans, and try to eat it regularly, either making a garbanzo salad with vinaigrette dressing or home made hummus. it’s not only delicious, but very nutritious as you pointed out. Your recipe will be a great variation for my salads.